Part Two in the brand new series from Holly Hepburn. Review: This is the second part of a 4-part ebook series following events at the Star and Sixpence Inn and in the lives of its owners, Sam and Vanessa Chapman. The first part in this new series was set very much in autumn, but, as the title suggests, this one covers the festive season, a busy time for the pub and the Chapman family. I don't really think that this ebook could be read as a standalone; much better to read all the parts in order to keep track of the interesting characters and incidents. The story picks up where the last one finished, finding us witnessing a very special wedding for the village. It sounds absolutely lovely, with the ceremony in the little village church and the reception in the pub and on the village green. Sam and Vanessa are getting used to having a new member in the family in the shape of Laurie, the half-brother that they knew nothing about until he walked into the pub one day. Unfortunately for Sam, another person walks in unexpectedly as a wedding guest and disrupts the friendship she has developed with Spanish chef, Gabe. 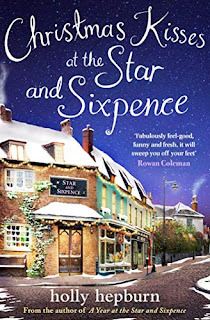 In fact, quite a few people turn up out of the blue in this story; they are familiar to readers of the last series about the Star and Sixpence and in the main very welcome. As well as happy events, there is tragedy in this story for one of the sisters and a great deal of worry for the other. All very dramatic against the backdrop of traditional Christmas festivities. This is a really lively story, with the customary festive events going on at the same as the main characters are experiencing major events in their lives, many of them heart-breaking. The author has written with great compassion about a tragic circumstance that will be familiar to so many people; be prepared with a box of tissues to hand. Both Vanessa and Sam are having a really hard time throughout the pages of the book and I was willing everything to sort out well for them. That's the only problem with a series like this; we have to wait many weeks before we can discover how things are going to pan out. That being said, I am still looking forward to finding out in the next episode.